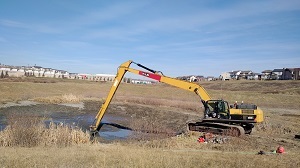 KLS recently completed a project in NW Calgary for a major developer that required the dewatering, sediment excavation, and inlet cleaning, and bank restoration at a residential pond. KLS followed strict municipal and Provincial protocols required to successfully manage both the water and sediment. KLS utilized a long-reach excavator to load out dewatered sediment material and dispose of it at an appropriate location. During dewatering KLS monitored turbidity of the water to avoid introducing sediment into the containment pond. Once sediment removal was complete, KLS restored the disturbed areas around the pond to pre-construction conditions.